This is another cake that I found on Sweet Pauls blog. This is actually the cake that got me started following his blog in the first place. I happened to spot it on my Facebook feed and it look so appealing that I followed the link over to Sweet Paul and have been hooked ever since. As it was yet another rainy weekend I thought it was a perfect time to stay in the kitchen and try some of his wonderful recipes. This cake makes 4 eight in layers. I was surprised and annoyed to find that once I dug into my pan cupboard I only had 3 eight inch rounds and as I didn’t feel like making a trip out to get another (and since I rarely make an 8 inch round) I just baked it in 4 nine inch rounds. The finished layers looked exactly like the ones pictured on the blog and as the cake only bakes for a short time I just kept a close eye on the cakes to keep from over baking and it all worked out fine. 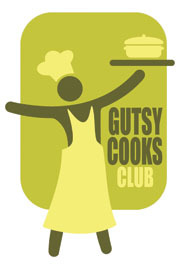 You will also notice that the recipe calls for green gel color but nowhere in the recipe does it tell you to use it. 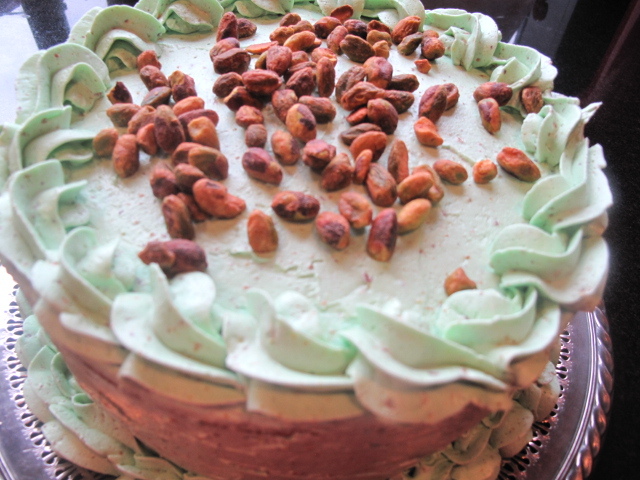 Based on the picture on Pauls blog, both the cake layers and the buttercream are green so I just added it to both the cake batter and the buttercream frosting. You can choose for yourself how you want to proceed with that. 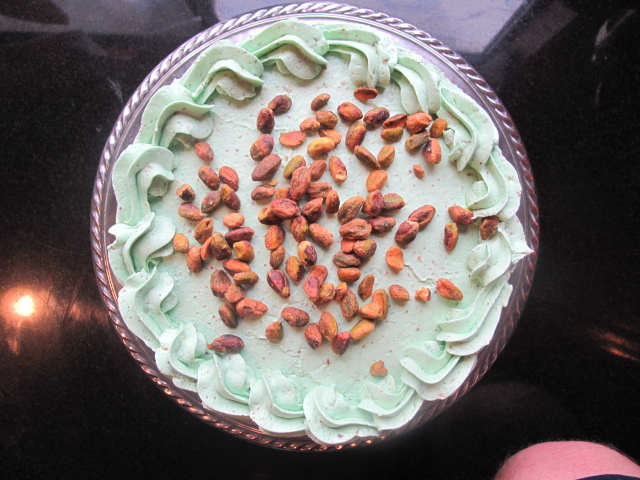 It is a lovely, light textured cake with the wonderful taste of pistachios. 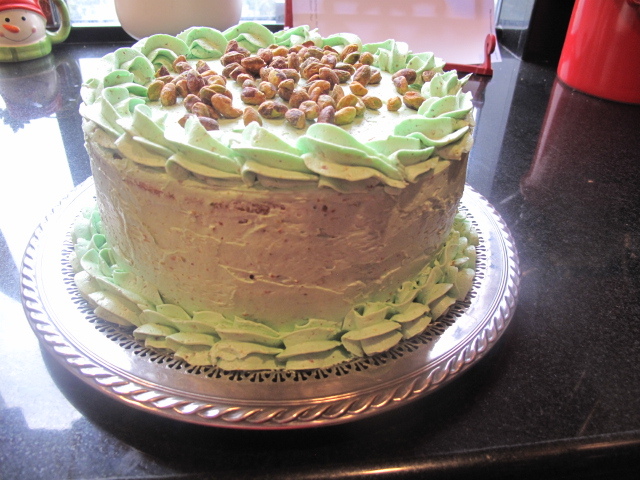 I am rather fond of pistachios (aside from the astronomical price you have to pay for them) so I leapt at the chance to try another cake using them. It is well worth the effort. The cake is very easy and the batter only takes a few minutes to put together and get into the oven. 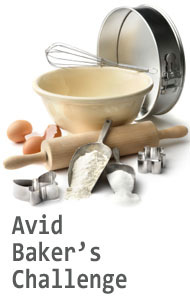 Even the buttercream is very easy and the whole thing pays you in flavorful dividends for your efforts. Try it on your next rainy weekend. In a large bowl, sift flours, baking soda, baking powder, and salt. Stir in pistachios. Set aside. In 3 parts, starting and ending with the dry ingredients, add the flour mixture and buttermilk into the mixer on low speed until incorporated. 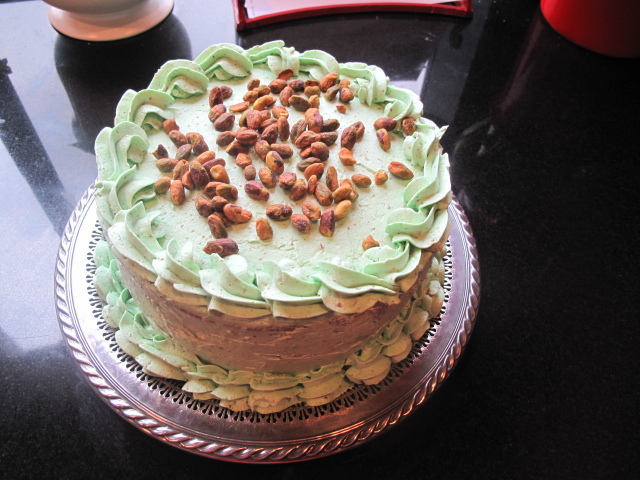 Make pistachio buttercream by beating butter until smooth and lightened in color in the bowl of an electric mixer. Add sifted powdered sugar and mix until combined. Increase speed to medium-high and beat until light and fluffy, about 3 minutes. Add pistachios, cream, and vanilla extract and beat for an additional 2 minutes.